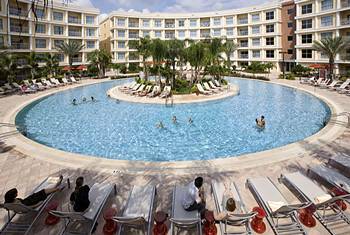 1 and 2 Bedroom All Suite Hotel at Disney’s town of Celebration, Kissimmee. A beautiful resort comprising luxurious 1 and 2 bedroom suites nestled in the award winning small town of Celebration . Conveniently situated just minutes from Walt Disney World , Universal Resort Orlando, Sea World, amazing shopping and limitless restaurants. Celebration also has much to offer with a great calendar of events as well as plenty of shopping and dining. Each suite is luxuriously appointed with Egyptian cotton bed linens, amazingly comfortable king sized beds, stunning bathrooms, fully equipped kitchens and wonderful living areas. All suites have balconies with beautiful views of either the stunning infinity pool or the beautiful lush Florida landscaping. Of course as a guest at Mona Lisa Suite Hotel you are entitled to privileges at Celebration golf and at Celebration day spa, complimentary high speed wireless internet, daily newspaper and complimentary shuttle to all the Walt Disney World Resort theme parks. Concierge service able to assist with almost anything else. Wow, 2 Centre Special and New Resort! We are pleased to be able to offer a fabulous two week holiday, 9 nights in the Disney area and 5 nights on the beach at Treasure Island for an amazing price. Facilites at The Mona Lisa include, a vanishing edge pool and whirlpool, Spa privileges at the Celebration Day Spa, Golf Privilieges at Celebration Golf Club, Free Transport to all the area theme parks, bicycle rentals. 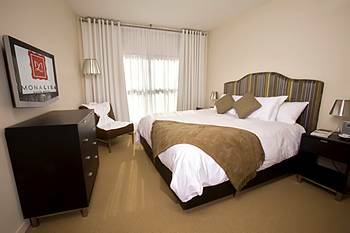 Accommodation is a 2 bedroom suite with sumptuosly furnished living areas, fully equipped kitchen and in suite washer and dryer. With a furnished balcony overlooking hte stunning infinity pool or the lush florida landscape. In one of our fabulous 3 bedroom 2 bathroom villas conveniently located along the 192 corridor with easy access to all the areas theme parks. All the villas have their own pools with space to sunbathe, that is if you have got time, with all the great theme parks and shopping close by! Your 2nd week – spent at Treasure Island at the fabulous Sunset Vista Resort on beautiful Treasure Island. A great idea to relax and enjoy the beaches away from the theme parks. We have a special offer available to all our guests. 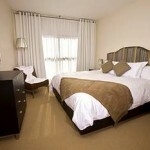 For Friday Arrivals combining The Mona Lisa and Sunset Vista we have a fabulous rate of £945 for a total of 14 nights. For Friday Arrivals combining on of our fabulous 3 bedroom 2 bathroom Villas and Sunset Vista Resort we have an amazing rate of £765 for a total of 14 nights. Go to www.djwrental.com to contact us for more details.